Paragliding is one of the top reasons why travelers are visiting Nepal particularly Pokhara. In fact, the city is even hosting an annual paragliding competition. In addition, the city is undoubtedly one of the best places to fly. They have the best condition to make this experience not only exciting but also safe. They have a perfect take-off area located at Sarangkot with the breathtaking view of the Himalayan ranges. In case you are planning to fly in Pokhara and have an access to the world-class paragliding experience, this article may help you. Pokhara comes with the right amount of ingredients that make it the perfect spot for paragliding. You will have a convenient landing area, safe take-off zone, and a stable temperature when you choose to fly in Pokhara. It may be true that paragliding may not fit everyone’s travel budget. However, it is still something that everyone should experience at a particular point of their life. There are at least 19 paragliding companies to choose from. All of them seems to offer a fixed price which will include the transportation fee and the insurance. The standard type of flight that will take up to 30 minutes will cost $75. Cross-country will be a bit expensive which can cost $110. Finally, if you want to add a GoPro video footage, the paragliding company in Pokhara will charge you with an additional $17. 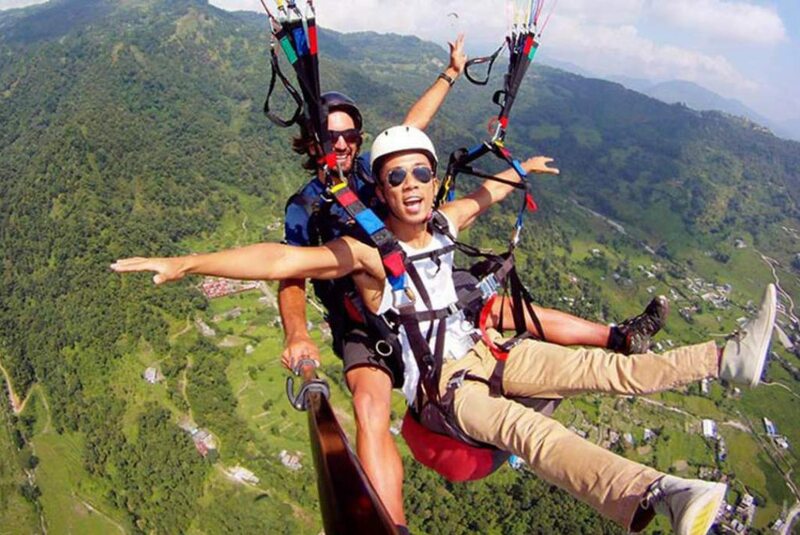 For the beginners in paragliding, they may want to choose the tandem paragliding when they fly in Pokhara. This simply means that you will be positioned in another harness. This allows you to have a more convenient way to paraglide. You will have the opportunity to take lots of pictures and talk freely with your pilot. For those advanced users, they can paraglide on their own. But before that, you will have to secure a flying permit at the civil aviation headquarters in Pokhara. This will cost you $45, and the permit will last up to 15 days. You will need a photocopy of your passport, proof of your insurance, photo, and photocopy of your visa. When you are looking for the best paragliding company in Pokhara, you will have to consider your safety. Normally, it is safer to paraglide in Pokhara rather than to cross the busy junction. Every participant will be armed with a reserved parachute. However, it is still considered as an extreme sport, and there are risks involved such as the sudden change in the wind. You need to ensure that the company is equipped with the necessary insurance. Their pilots should also be internationally certified, and they should complete the required 15-day training program in Pokhara. Finally, you should also look for the paragliding company in Pokhara that offers flying lesson. The introductory lesson will cost $120 which will include all the types of equipment that you will need. This will allow you to do paragliding on your own and in any parts of the world.